A ranked ballot is a ballot in which a voter expresses either complete or incomplete preferences among the alternatives. 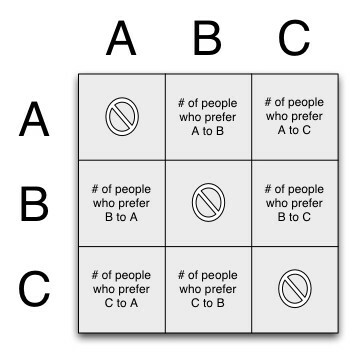 For example, if there are five alternatives, a voter might ranked the alternatives as A > B = C. This means the voter prefered alternative A over all other alternatives, believed that B and C were equivalent, preferred B and C over D and E and believed that D and E were equivalent alternatives. A ranked ballot of the form 3:A>B=C means that there were three people who had the same ranked ballot. A cycle is formed when a sequence of defeats leads back to the same alternative. 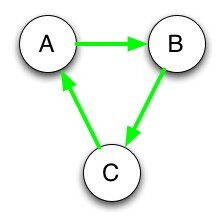 An example of a cycle is when alternative A defeats B, B defeats C and C defeats A.